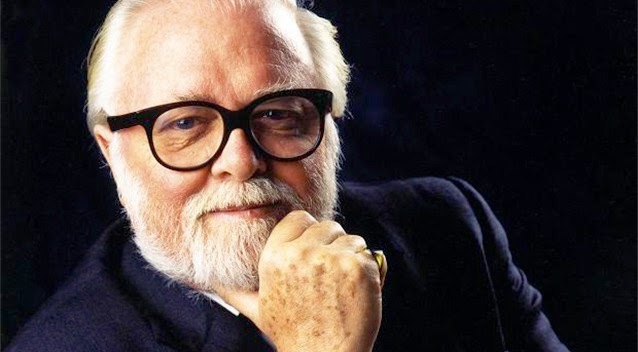 Richard Attenborough is certainly among the greats who have influenced mass communications media and, especially, cinema. He passed away on August 24 and was 90 years of age. Thanks to the Jurassic Park, we do know Attenborough was a capable and exceptional actor, but he was an equally remarkable filmmaker. His style of filmmaking largely set the direction to biopics of epic proportion and genres such as political dramas set in the colonies and war movies. Apart from his performance as Prof. John Hammond, the theme park financier in Jurassic Park, he played a memorable part in the Steve McQueen World War II thriller, The Great Escape. He is also remembered as a warm Santa in the Miracle on 34th Street. He also played a part in Satyajit Ray's The Chess Players. Known for his charming demeanor, Dickie's directorial debut was the cheeky musical satire Oh, What a Lovely War, which was set in the World War I scenario. The film featured a star studded ensemble including Laurence Oliver, John Gielgud, Jack Hawkins, John Mills, Michael and Vanessa Redgrave, and Maggie Smith. Having appeared in quite a few war movies in his early career, his A Bridge Too Far looked like a masterstroke from an accomplished general. This ensemble featured the likes of Sean Connery, Ryan O'Neil, Liv Ullman and, of course, Laurence Olivier. He had this knack of attracting top stars to his films. Or even discover completely new ones for grand roles. 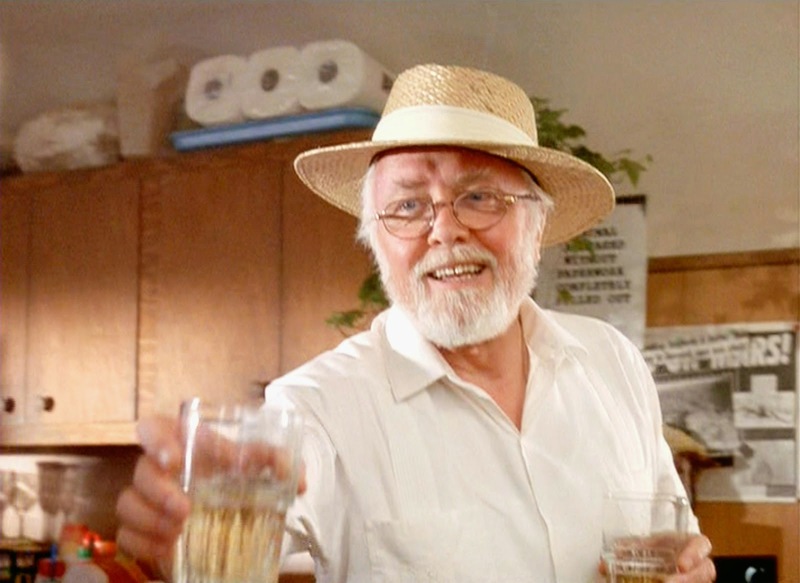 Richard Attenborough was truly a cinematic visionary, creating some of the grandest spectacles in the history of film. But it was not until his biopics, which were probably the last films of their kind in the English speaking world, that set him on the path to greatness. In 1980, he produced and directed Gandhi, a film which remarkably reproduced the Indian Raj in the times of one of the most extraordinary human beings in history. And with a natural like Ben Kingsley, it seemed that Gandhi himself had come to life. The film won 8 Oscars including Best Picture and Best Director. During the production, thousands of Indians had actually mistaken Kingsley to be Gandhi back from the dead. And who could possibly forget those amazing visuals of the funeral in Delhi and the scenes from the migration. But more than anything else, Gandhi told the story of a peacemaker, and as a storyteller, Richard Attenborough created history with it. A decade later, he produced Chaplin, which was an astonishingly moving recreation of the life of film genius Charlie Chaplin. Just like he utilized Kingsley for Gandhi, he handpicked a brand new actor, who we today know as Robert Downey Jr. to play the title part. The masterful impressions and brilliant portrayal of Robert Downey of the cinematic giant won the hearts of millions in cinematic audiences worldwide. He continued making powerful films in Cry Freedom, Magic and Closing the Ring and left a lasting mark on the history of motion pictures. It seems that a golden age of cinema is ending with his death. At the Emmys last night, the number of nominations never mattered in the end as Game of Thrones and House of Cards failed to grab any major awards. On the other hand, the show was stolen by Breaking Bad with 5, Modern Family and Sherlock: His Last Vow with 3 each and 2 each for American Horror Story: Coven and Fargo. The most successful networks were also not the one with the most nominations. AMC and CBS topped the tally with 5 awards each, while HBO stood at 4. The following is the list of program-wise award winning tally for multiple award winners. The outstanding comedy series went to Modern Family, the miniseries to Fargo, while the Best TV movie went to The Normal Heart. Prominent winners among acting nominations include Julia Louis-Dreyfus for Veep, and Jessica Lange and Kathy Bates for American Horror Story: Coven. Benedict Cumberbatch clinched the TV movie/miniseries lead acting award for Sherlock: His Last Vow. True Detective only managed one win with Director Cary Juji Fukunaga winning for Outstanding Directing in Drama. 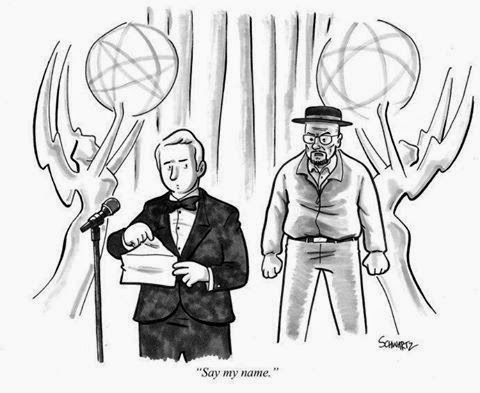 The acting awards in drama category were swept by Breaking Bad, while things were a lot more scattered in the Comedy genre. The biggest shock of the evening was a rather predictable one. For the Lead Actor category in Drama, Bryan Cranston finally prevailed over the formidable lineup of Matthew McConaughey, Kevin Spacey, Jeff Daniels and Woody Harrelson. Though McConaughey was teased quite a few time for his nomination in the show. But yes, it's no shock. Doesn't this New Yorker cartoon seem even funnier now? A lot of people, including this blog, was pretending that the race for lead actor was closer than it was, but we all knew that Breaking Bad was going out of its love affair with the Emmys in a grand note. 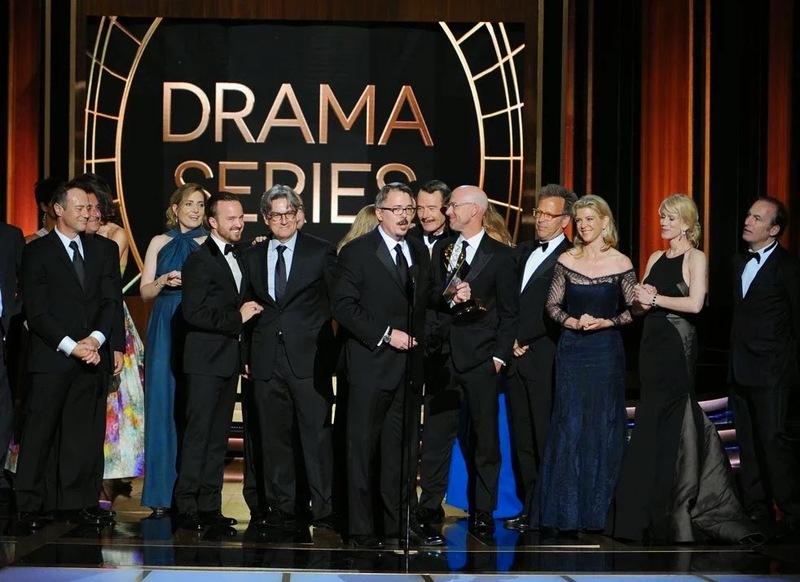 In addition to Bryan Cranston, Breaking Bad also clinched the Outstanding Supporting Actor and Actress Emmys for Aaron Paul and Anna Gunn respectively. Finally, which other show but Breaking Bad could possibly win the Outstanding Drama award? And who else but Vince Gilligan could receive it. The complete list of winners on the Primetime night can be seen here. If you missed the breathtaking Billy Crystal tribute to Robin Williams, here is a glimpse. Also, if you are a Seinfeld fan, well this happened. The Primetime Emmys are pretty much the Oscars of the TV and this year's ceremony will be held on Monday evening in Los Angeles. The show will be hosted by Seth Meyers. This year we have had some of the best shows in quite a while. So this year's show would be particularly exciting with some of the best dramas nominated together including Game of Thrones, Breaking Bad, House of Cards, Downton Abbey, Fargo, Mad Men and True Detective. In terms of nominations, Game of Thrones ruled this year's Emmy like no other show with 19 in total. But it remains to be seen how many would it be able to win. Other shows with top nominations are the miniseries Fargo with 18, American Horror Story: Coven with 17 and Breaking Bad with 16. 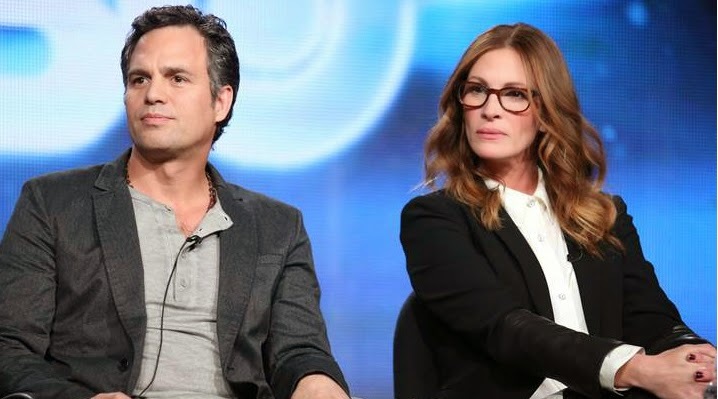 TV movie The Normal Heart also stood out with 16 nominations, including Julia Roberts for Best Actress in a television film, going up against the likes of Kathy Bates and Angela Bassett for American Horror Story: Caven and Ellen Burstyn for Flowers in the Attic. For the same TV movie, Mark Ruffalo has been nominated for Best Actor, who would be facing some tough competition with the league of Oscar nominated actors in Benedict Cumberbatch for Sherlock: His Last Vow, Billy Bob Thornton for Fargo and Chiwetel Ejiofor for Dancing on the Edge. Most people would be looking forward to the showdown between Matthew McConaughey for True Detective, Bryan Cranston for Breaking Bad, Kevin Spacey for House of Cards, Jeff Daniels for The Newsroom and Woody Harrelson for True Detective. However, top nominations will remain to be the Outstanding Drama, Comedy and TV movies or Miniseries. The following is the complete show-wise nomination tally, with all the categories included. When it comes to networks, no one was even close to HBO, which bagged the greatest number of nominations with 99. Other prominent networks included CBS with 47, NBC with 46, FX with 45 and ABC with 37 nominations. An ensemble of star presenters are going to appear in this year's show. The list of presenters include Julia Roberts, Matthew McConaughey, Zooey Deschanel, Bryan Cranston, Julia Louis-Dreyfus, Woody Harrelson, and Halle Berry. Of course, some of them are nominated too. Also, don't miss the awards ceremony, as a tribute to Robin Williams will be presented by his long time friend and the Father's Day costar Billy Crystal. Robin Williams passed away on August 11, 2014. Pakistani audiences can catch the show live on Star World at 0530 HRS, in the morning. You can find all the 66th Primetime Emmy Nominations here. We are really looking forward to see who grabs the most Emmys. It's been 100 years since the World War I started. And it is an understatement to say that it had a decisive impact on the way we know the world today. There were a few great men who played a larger than life role in how the war changed the world. One of them was T. E. Lawrence, better known to many as Lawrence of Arabia. The man who led the Arab revolt against the forces of the formidable Ottoman Empire. Now this boring into (to some) was necessary for those who are already not familiar with the man or the film. Because his life was filmed in the most memorable manner in Lawrence of Arabia (1962) by master English filmmaker David Lean. The film features renowned actor Peter O' Toole in the title role, for which he was nominated for an Oscar. The film also features Omar Sharif as Sherif Ali, Zia Mohyeddin as Tafas, Anthony Quinn as Auda Abu Tai, Jose Ferrer as the Turkish Bey and Sir Alec Guinness as Prince Faisal. The film is known for its groundbreaking cinematography, conceiving which was mainly David Lean's genius. The spontaneity of certain moments in the film are magical. And particularly, the remarkable Oscar winning score by Maurice Jarre takes the cinematic experience to another level. As a matter of fact, the soundtrack of Lawrence of Arabia is one of the most popular and recognizable scores ever produced. The film grabbed an astounding number of 7 Oscars, including Best Picture and Best Director. The film did not win any acting Oscars, with O'Toole and Sharif nominated. This was Peter O'Toole's debut film, but despite the early nomination, he was never able to win an Oscar throughout his life. Though he came darn close in The Lion in Winter (1968). He received an honorary Oscar in 2003. There is a lot to read about the film. But you would be compelled to read it once you watch it. 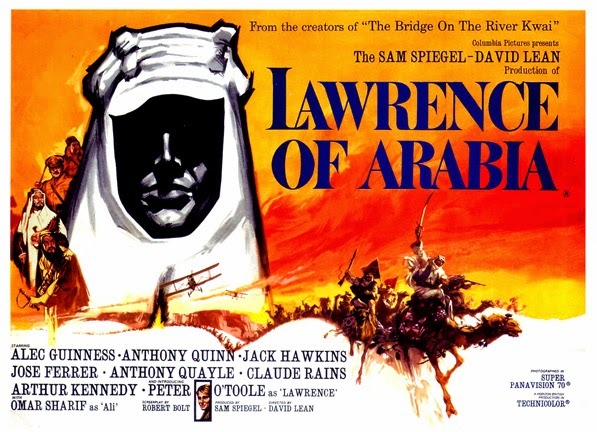 If you haven't watched Lawrence of Arabia yet, it must top your watchlist this weekend. Very few other good things in the world are going to equal the value it will bring to your time. Here is the first look. In the age of information, not everybody can tell fact from fiction and real news from satire. 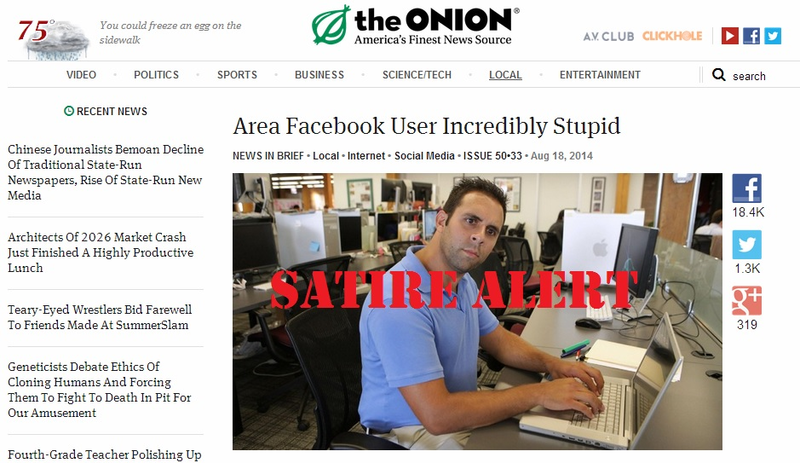 Apparently facebook is beginning to take this statement very seriously because they are considering introducing satire tags for posts from the likes of The Onion. Curiously, some of their posts are eerily close to reality, which is why it can actually be useful at times. So now people get to see what post is satire and which is not, which means we would miss all the fun. Anyway, this only goes to show how much internet giants have started taking the sensitivity of content seriously. For now the satire tag is in testing phase. We just learned that Google is now considering introducing YouTube and Gmail accounts for children. This offers much greater control and easier use for parents who want children to use separate accounts with age-restricted filters. Perhaps the new facebook newsfeed was a part of this experience too, apart from offering a realistic amount of data in a given time. It would be interesting to see how politics and ethics keep on molding how the internet is used in the future. Did You Notice that Save Button? No, we're not reminding you to keep hitting the save button while you work on your word processor files and spreadsheets. We're talking about that new Save Button on facebook posts. 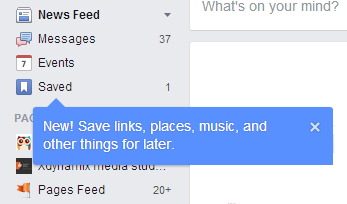 Facebook recently introduced the feature of "Save" on every post, which is the social media platform's version of bookmarks. And before you would be worried about whether others would be able to see what you save, it's going to be all private. Undoubtedly, this feature adds a lot more experience to the user experience. If you have ever missed a facebook article while you were glancing down the newsfeed and were never able to find it again, you know the feeling. This is where the Save feature comes in. What this feature actually does is that it would save a story or link for you to read later. The news feed would store the story and at a later time, it might pop up later in the newsfeed. Or you could actually access it at any time by simply clicking the new "Saved" button on your navigation sidebar. So if you didn't already know about this feature, it could help you save a lot of trouble. Especially given how out of control newsfeed post updates are. Always thought facebook posts should load like tweets. But still facebook newsfeed offers a far richer experience. A lot of people freak out that the facebook newsfeed has virtually turned into a digital newspaper and that your interest directs what you get to read. But actually, it is a good thing that at least a lot more people get to see and read stuff that they otherwise would not anyway. A lot of people also freak out about the constant changes in the facebook interface, but probably the dynamism and adaptability of the platform are what allow it to excel. So perhaps, we should learn to bear with them. 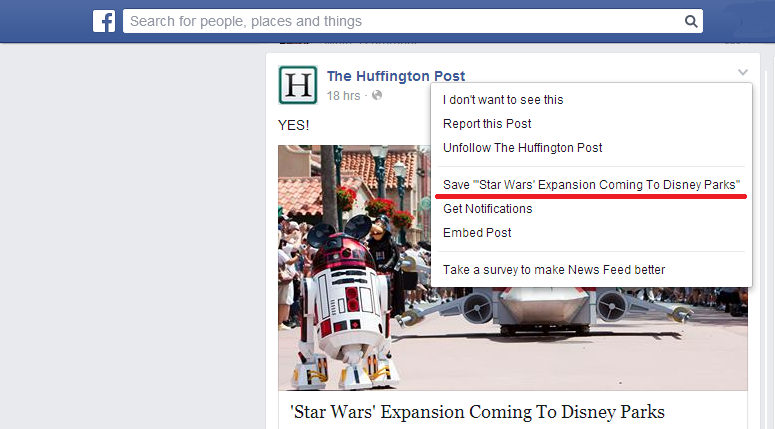 In any event, given how cluttered everybody's newsfeed is, it is about time that facebook introduced this feature. Make the most of it.